Lila Emerson is fascinated by other people's lives. As a house-sitter, she loves looking after the glamorous, sophisticated homes she could never afford herself. And as a writer, she enjoys watching the world go by, dreaming up stories for the people she sees from her window. But then one day she witnesses something only too real - the brutal and shocking murder of a young woman living across the street in New York. And now, because of what she saw, Lila's own life is in immediate danger from an audacious, single-minded assassin who kills for profit and for pleasure. 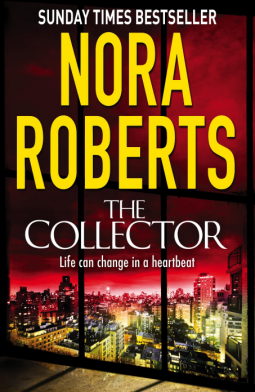 The Collector was a perfect read to savour over the Easter break. Dipping into it was like tasting and relishing dark chocolate. Yum! It was a comfort read, with great characters, romance and some suspense, murder and little surprises along the way. I loved Lila, the main female character, she was strong, sassy and so able to take care of herself and all those little things that go wrong around the home. She loves animals, writes books for teens and is a trusted house sitter. Her only problem is that she is just ever so slightly - independent. Ash is a wonderful hero, passionate about art and painting, and very caring of his huge family. He knows women, he has a wealth of them - a mother, stepmothers, sisters. When he meets Lila he falls for her and wants to take care of her. Well Lila is not the kind of woman who succumbs to that, and he is in for some heart stopping moments when she faces into danger. A dangerous woman is out to find some valuable Imperial eggs for her employer. Jai is ruthless and she will go to any end to attain them, and collect a few little souvenirs along the way. She will murder, and has murdered. As you read you just know there will be a final showdown - but when and where and with who? The final part of the book kept me reading late to find out. As well as the relationship of Lila and Ash, the renewed relationship of Lila's friend Julie with Luke, is also a little added romance. They are very much part of the story and work along with Lila and Ash most of the way. So settle down with your favourite drink and nibbles and enjoy some vintage Nora Roberts. I did! YAY 5 stars, yours is the first review I've read ... now I'm excited for this one! !